We determine comfort not by temperature, but by air flow. I wrote a post for Homescape that makes a perfect fit into this series (and I am sorry for not working on these posts recently, too much to do right now). I am going to send you there to read, instead of repeating it here. The link is Keeping Your Home Comfortable. I wanted to add to what I wrote there by providing some drawings to illustrate my intent, but they did not scan well, and I tried experimenting with Gimpshop to see if I could improve them. Here are the two drawings which may come out well. The second illustration is on a topic not mentioned in the original post: controlling air flow into different parts of your home with diverters. Your air conditioning system is blowing out air at the same pressure to all of the ducts from the plenum to your registers. 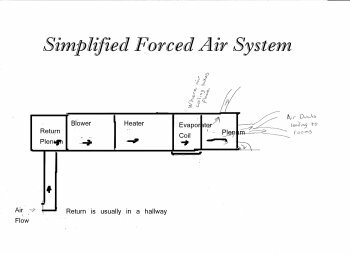 A register closer to the unit will dump the air faster into the room, so more air can be excepted into the duct. This makes rooms closer to the plenum more comfortable. Rooms further away do not obtain the same amount of air, since more has to be pumped into the duct. To correct this, you could have doors to the ducts which control the amount of air flowing in the duct. Less air for closer rooms, more air for ones farther away. In this way, all of the rooms will cool or heat at the same rate, so the system will not shut off before the entire house has been cooled or heated. Frequently, people will set the temperature hotter or cooler just to have those farther rooms reach a comfortable temperature. 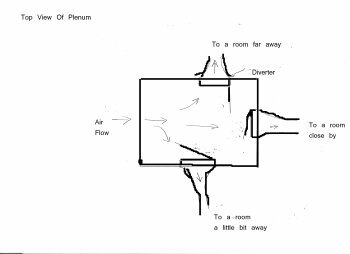 The basic idea of creating these restrictions in the plenum is simple, and a homeowner could install them, but the adjustments are best handled by an HVAC professional. This entry was posted on Tuesday, November 4th, 2008 at 5:19 pm	and is filed under Green home conversion. You can follow any responses to this entry through the RSS 2.0 feed.